More than 21,000,000 AdGuard users enjoy better, faster and safer Internet. The ad blocker extension clears all ads in Safari and fights data tracking to protect privacy. Remove all kinds of ads from Safari browser easily. We have plenty of ad blocking filters and even an ability to manually remove ANY element on the page that you don't like. Make your personal information protected by blocking trackers, spyware, malware, and adware. AdGuard will also tell you if you visit malicious or phishing websites. 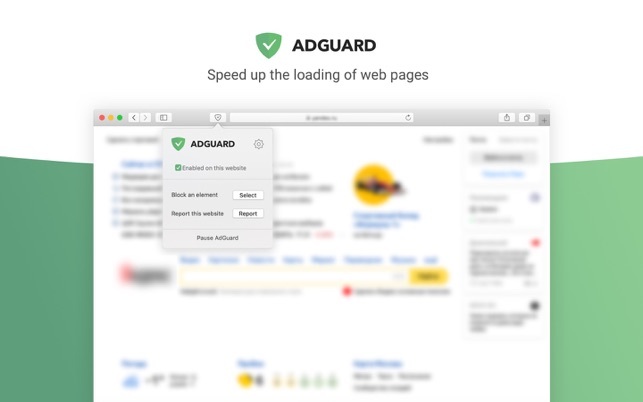 By preventing annoyances, trackers and analytical systems from loading when you visit a certain page, AdGuard makes browsing smoother and faster. Year 2018 is nearing its end. And the closer it gets, the more urge we feel to make some last-minute fixes. So, here is another hotfix for AdGuard for Safari, just random minor-ish stuff really, but it just doesn’t feel right to go into the new year with unfixed bugs at hand :) Enjoy AdGuard and happy New Year! After upgrading to Mojave, I found Safari has completely changed its mechanism of extensions. All of my ad block plug-ins now only function in very limited manners (no filter setting, no element inspections etc.). And I feel particularly annoyed -- I browse Chinese websites frequently, yet almost all ad blockers would never succeed in removing ads in foreign languages unless you set up filters manually. Yet as I said before, all most all ad blockers under Mojave are too succinct to offer such advanced features. Thankfully, I finally found this lovely, amazing, elegant, useful, powerful AdGuard. The pre-installed language-specific filer lists are totally incredible. To Mojave users, if you're reading this review, pls stop searching for other ad blockers. 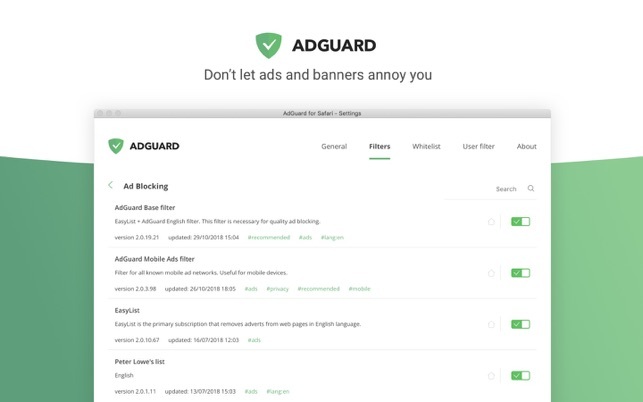 AdGuard is THE BEST! Just Installed — Works Great! I’ve been very annoyed lately with the growing presence of distracting ads on some of my favorite news sites, like the Washington Post and SFGate. So I just installed AdGuard. I chose to not launch AdGuard at login, but to show the icon in the menu bar. This way, I can turn on AdGuard when I’m on a site where I want it active, such as the Washington Post, and turn it off the rest of the time. It works great! When I turn it on, all the ads disappear. Couldn’t ask for more. I am so glad I downloaded AdGuard. Been past ad software user, mostly sarisfied and was dissapointed with lost functionality in Mojave. After being annoyed with one too many expanding banner ads, I searched the app store, found this, and wow! What an unexpected surpirse. Works, doesn not slow my browsrer down (in fact, it feels peppier). Excellent work by the developers! !